The Canadian poker player Daniel Negreanu also know as “Kid Poker” is second to only Phil Ivey when it comes to all time career earnings at an amazing 12,836,012$. He belongs to the elite group of poker super stars who are often seen battling it out on the High Stakes poker TV show. Daniel Negreanu is known for his easy going yet outspoken nature that has led to more than one controversy during his career. 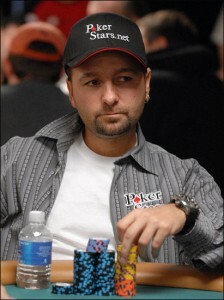 Negreanu was born the 26th of Juli 1974 in Toronto, Ontario into a family who originally immigrated from Romania. In this post I will attempt to cover the essentials of Negreanu’s poker career including the story of how he built his substantial poker bankroll. [adrotate group=”6″]At the age of 15 Daniel learned how to play poker and although at this time he was aiming for a professional snooker career he soon realized his talent for poker especially when it came to reading his opponent’s hands. Spending his time building his bankroll by hustling unsuspecting victims in pool halls as wells as playing cards, Daniel dropped out of college aged 21 and moved to Vegas aged 22 to make a living playing poker. His dream ended abruptly within the first year when Vegas consumed his entire bankroll. Determined to break through in Vegas, Negreanu traveled back to Toronto to rebuild his bankroll only to lose it all again. This cycle continued until 1998 where Daniel entered his first World Series of Poker Event, a $2,000 Pot Limit Hold ‘Em event and won it thus becoming the youngest bracelet holder at the time, rightfully earning him the nickname “Kid Poker”. The rest is history. Cash games are not Negreanu’s strongest game and he openly admits to this. Actually, Daniel is one of the few pro poker players who is very open and talkative about his game. On the TV show High Stakes Poker he has a hard time beating online sharks such as Tom Dwan “durrrr”. And no one forgets the memorable 575000$ hand lost to Gus Hansen during the second season of High Stakes Poker with a full house sixes full of fives against Gus Hansen’s quad 5’s. However lately “The Kid Poker” has made a real effort on the 100-200$ 6max No Limit Hold’em games on PokerStars including an amazing $454.836 rush over 1.870 hands! Hopefully Negreanu will be able to make a lasting winning transition from tournament player to cash game player while maintaining his impressive tournament results. Negreanu is a golf enthusiast as well as a passionate NHL fan. In addition “The Kid Poker” runs his own blog and poker information site at Full Contact Poker. Full Contact Poker originally started as Negreanu’s own poker skin in 2005, however when Daniel became part of Team Pokerstars in June 2007 his Full Contact Poker skin was terminated and the webpage continued as Daniel’s personal blog where he regularly posts tales from his life as a professional poker player. In addition, Negreanu has appeared in numerous poker TV shows as well as written books and appeared in a short scene of X-MEN: Wolverine. Daniel Negranu’s outspoken nature has resulted in several controversies. One of the most hyped is when he called Annie Duke a “F***ing C***” after a dispute whether it was reasonable or not that several men had entered the 2010 WSOP ladies event. As far as I know, no apologies have later been given by Negreanu, so I guess he meant what he said. Another widely debated controversy was centered around “The Kid Poker’s” commenting of the Black Entertainment Television (BET) network. In short, Negreanu pondered how it would go down in the media if a guy from Alabama made a White Entertainment Television network. Since this would obviously be frowned upon why was it then OK to make the BET. Upon these comments Daniel was accused from many fronts of being a racist which in my opinion was a rather unfair reaction to what was essentially a harmless comment. How did Gus Hansen build his poker bankroll? Are You Truly Putting Your Opponent on a Hand?